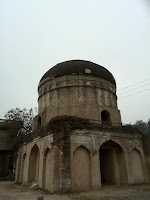 Starting from the Shalimar Link Road intersection with the GT Road, and heading west, we stopped after exactly 2.6-km and easily spotted a domed tomb just south of the road, inside a fenced enclosure. The dilapidated state of the tomb was deplorable, though the fascinating architectural elements of what remained were worth a brief scrutiny. But first, we had to settle who is the actual occupant of the tomb. That the mandarins at the Department of Archaeology are clueless, can be confirmed by the display of two conflicting information boards at the entrance. 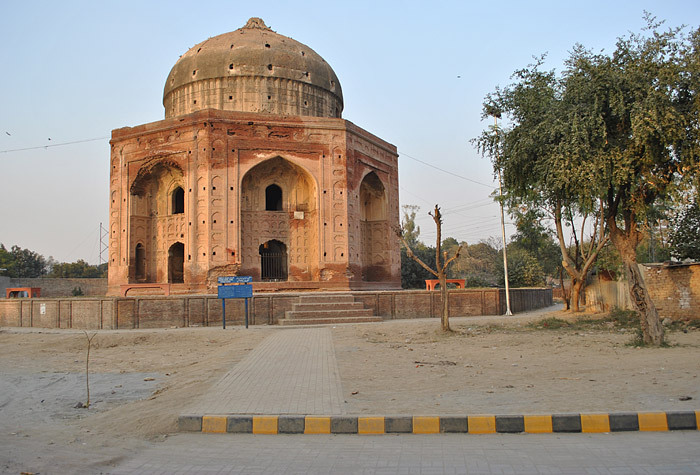 One of them claims it to be the tomb of Buddhu, a brick-maker who lived in the mid-seventeenth century; the other board says that it is the resting place of the wife of Khan-e-Dauran Bahadur Nusrat Jang, a favoured noble of Emperor Shah Jahan. For want of her maiden name, we shall call the lady Nusrat Begum for this discourse. While Buddhu’s influence to be able to muster a plot of land amidst the prized estates of the Mughal nobility must seem outlandish, his having left a fortune for the construction of a grandiose tomb is equally incredible. His nearby brick kiln (Buddhu ka ava), whose remains can still be seen, could have led to the erroneous association with ‘Buddhu’s tomb’. Khan-e-Dauran Bahadur Nusrat Jang was a favourite amir in Shah Jahan’s court, having gained the goodwill of the emperor for suppressing a rebellion in Deccan. He died in 1659 and was buried in a tomb which lies 1.5-km to the south-east of his wife’s tomb. Since his own tomb lies squarely in Pakistan Railways lands and is not accessible to the public, some people have further added to the mystery by assuming Nusrat Begum’s tomb to be that of her husband’s. 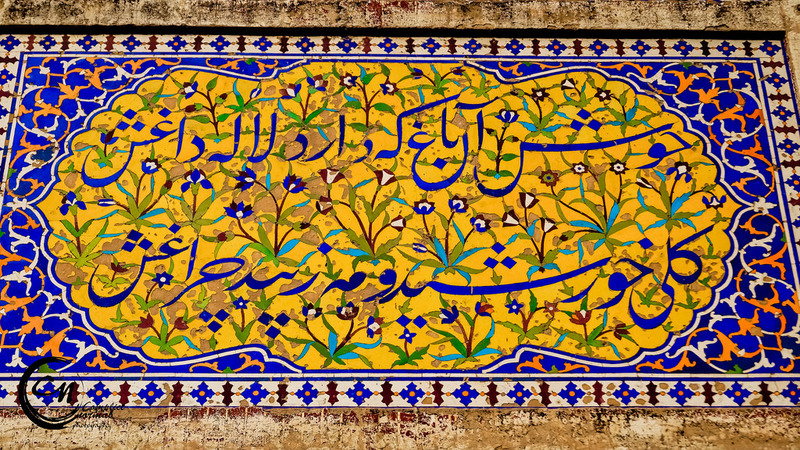 Intriguingly, a second grave in the begum’s tomb brings this riddle to a head. Not yet done, the enigma gets really knotty when we learn that Khan-e-Dauran’s own tomb has been re-purposed as a mosque and a shrine by employees of the Railways under the name of Khawaja Hasan’s, though the Khan’s real name was Khawaja Sabir. One wouldn’t be surprised if the Railways employees yet again re-purpose the tomb-shrine in the name of one more Khawaja! The much ado about Nusrat Begum’s tomb occupancy is less significant, I thought, than its architectural composition which needs attention. 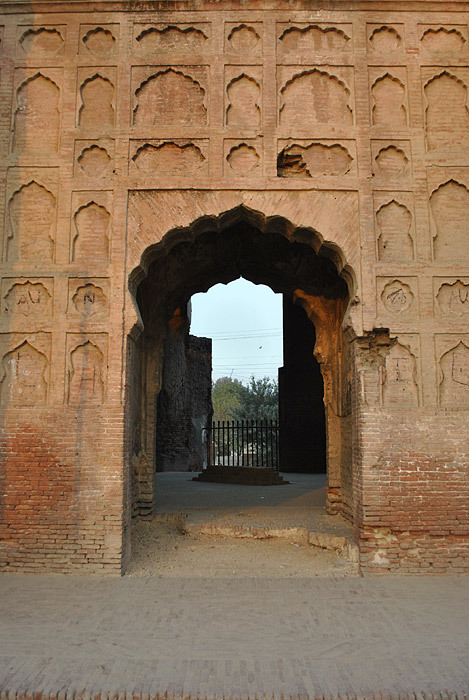 Square in shape, the main chamber is constructed in massive brick masonry, with an arched opening flanked by two recessed arched panels on all four sides, creating a baradari effect. The low dome rests on a high circular drum, which in turn rests on a short octagonal base, resulting in a gradual ‘smoothening over’ from the main square structure upwards. On the whole, the tomb has an overbearing appearance, which must have been softened somewhat by Kashi-kari mosaic tiles, remnants of which are visible in some portions of the dome. Backtracking about one kilometre from Nusrat Begum’s tomb, we turned right, heading south on Wheatman Road (corrupted to ‘Wehtmun’ by the Punjabis). After about half a kilometre, we came across two boards alongside a wall, indicating Ali Mardan Khan’s tomb and the nearby Hamid Shah Qari’s shrine. A steel gate opened into a strange narrow vestibule with an iron lattice for a roof, all 400 metres of the way. A chowkidar, who had done us a special favour to let us in on a Sunday (closed to public), welcomed us heartily, for we had coordinated earlier and had promised to be good to him. Ali Mardan Khan was a Persian Governor of Kandahar who became a turncoat to his master, Shah Safi I of Persia, after having been bribed handsomely by Emperor Shah Jahan in 1638. Ali Mardan quickly found favour in the new court as Amir-al-Umara, and was granted governorship of Kashmir and Punjab. He is best known for his engineering skills in various public works, including a canal running from River Ravi to Shalimar Gardens, and a similar canal in Shahjahanabad, Delhi. He died in 1657 and was buried in the tomb that he had built for his mother. The tomb is an imposing structure, with an octagonal main chamber, with eight arched, deep-set alcoves, all opening to the interior. 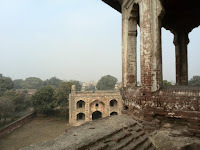 Atop the corners of the octagon once stood Rajasthani chhatris, of which only two survive. 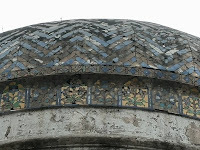 The dome stands on a high drum in Timurid style. 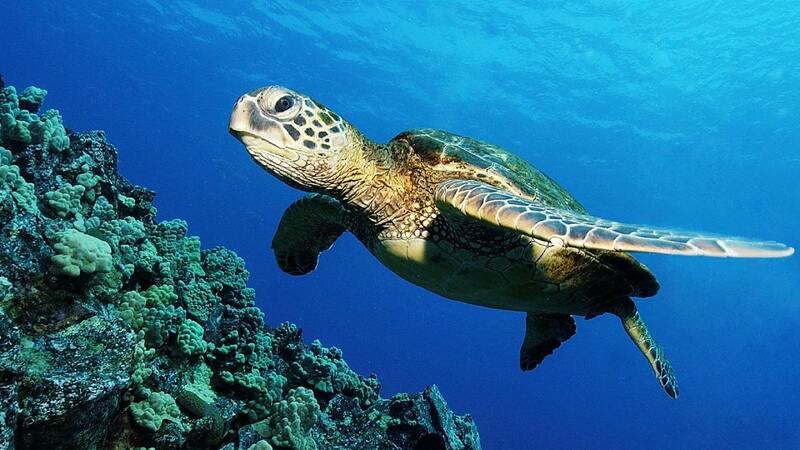 We discovered a remarkable double-shelled feature of the dome when one of the youngsters called us from somewhere above. We followed his calls, climbing up a special stairway, which took us to the top of the inner dome. There we stood in the dark and dingy gap between the two domes, much like school children who had discovered a secret passage to a treasure trove. We were surprised to see candles, a prayer mat, and knotted ribbons on a streamer, and wondered if these were signs of transition to a shrine. 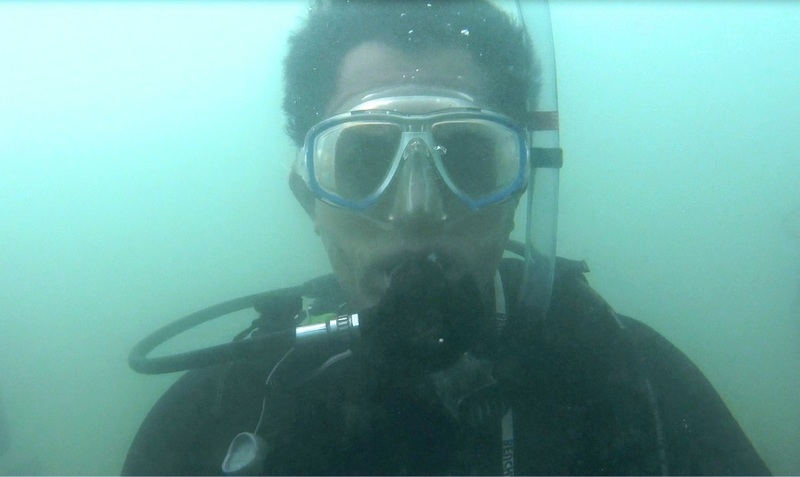 Indeed, the subterranean chamber of the tomb which houses the grave, had been treated as a shrine – as well as a pot-smoking den – by unscrupulous characters, the chowkidar revealed, which is why entry to the public has been restricted. Keen to know more about double-shelled domes, I later learnt that these were a construction compulsion for large domes, in which the inner dome was constructed first, allowing the supporting framework and trusses to be placed on top of it. Thus supported, the bigger outer dome could be built with ease. Better acoustics (for mosques and cathedrals) was an added bonus. The smaller and relatively flatter inner dome also simplified ceiling artwork. About a hundred metres north of the tomb is an utterly dilapidated gateway to the funerary garden, that once existed. 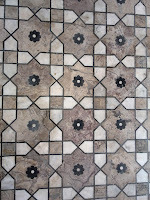 It has remnants of Kashi-kari mosaic work, and is quite similar to the one at the Gulabi Bagh Gateway in Begumpura. The designer of the ‘Versailles of Punjab’ as Shalimar Gardens have been called, deserved a better-kept tomb complex, we thought. Going along the Canal Bank Road, past Zaman Park and Royal Palm Golf Course, when a road from Garhi Shahu (left side) is intercepted, a large domed structure can be picked up over the left shoulder. 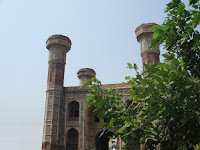 A simpler map location would place it just outside the Railways Carriage Factory, at the southern limit of Mughalpura. Arriving at our destination in a swarm of over a score cyclists, and with the neighbourhood in complete awe, we went through our usual motions of photography and a bit of adventure. 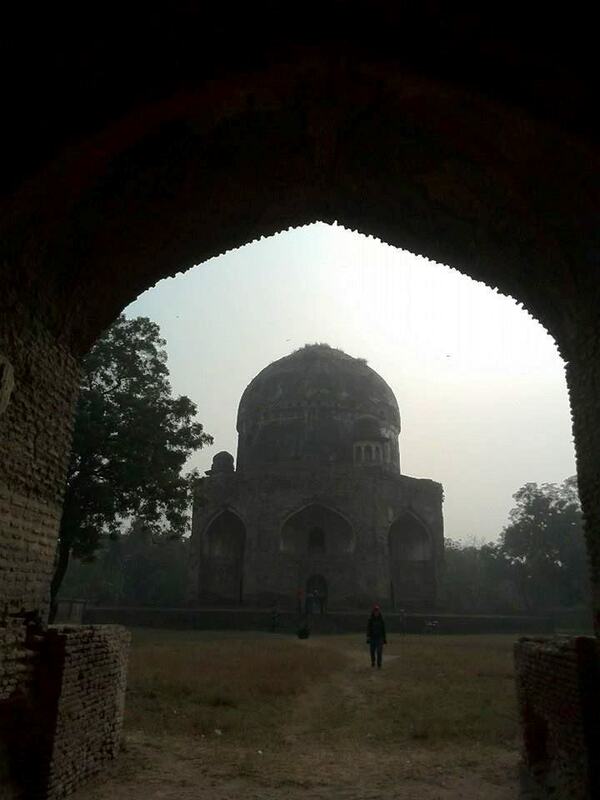 Some clambered up secret staircases and discovered another double-shelled dome, while others explored the upper floor galleries full of graffiti that Pakistanis must always bless their imaginary beloveds with. 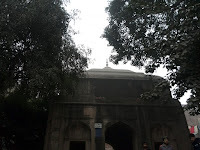 The occupant of the tomb carries a long-winded title viz, Khan-e-Jahan Nawab Bahadur Zafar Jang Kokaltash. He found favour with Emperor Aurangzeb for capturing his recalcitrant brother Prince Dara Shikoh, who was promptly executed for heresy. Bahadur Khan was then put in charge of Deccan to bring matters under control there. He also served as Governor of Punjab. He died in 1697. He is often confused with another Khan-e-Jahan, a nobleman in Emperor Akbar’s court. The tomb is octagonal in shape, with eight deep-set alcoves, each having an entrance arch at the ground level, and another arched opening at the upper level. The brick tomb is bereft of any outward embellishment, though pigeon holes all over the building suggest a marble facing, since removed by, who else but, the Sikhs! 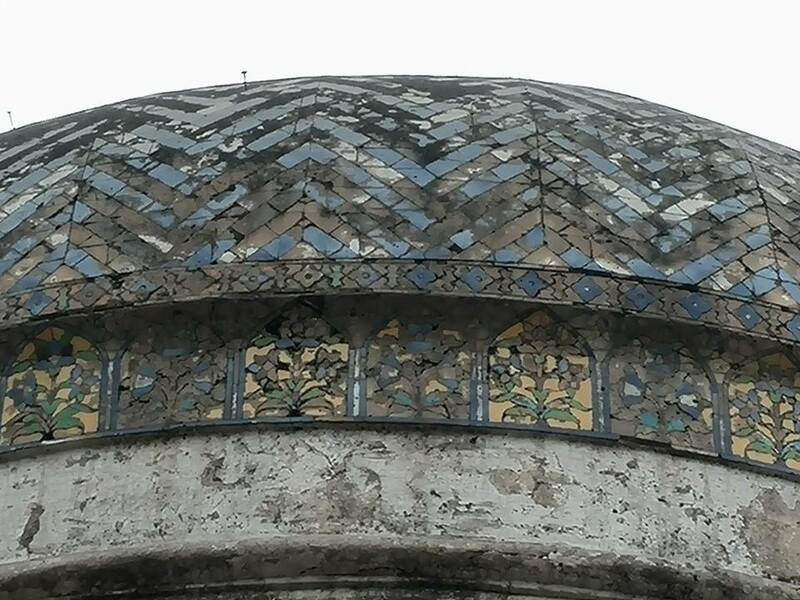 The dome is slightly higher pitched, with an inverted lotus finial on top, giving it a more sinuous appearance than the classic Timurid ones that we had seen earlier. 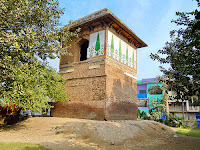 The historian S M Latif wrote in 1892, that the tomb was “surmounted by turrets with cupolas”, none of which exist today. He also mentions that the tomb was used as a theatre for the British military officers, when the adjacent Mian Mir locale was established as a cantonment. We noted that the two noblemen Khan-e-Dauran and Khan-e-Jahan were essentially loyalists to their emperors, while Ali Mardan Khan did great public service to the Lahorites. In a fund-constrained regime, it is the latter whose tomb deserves major renovation, while the other two tombs could do with simple preservation, for the time being. 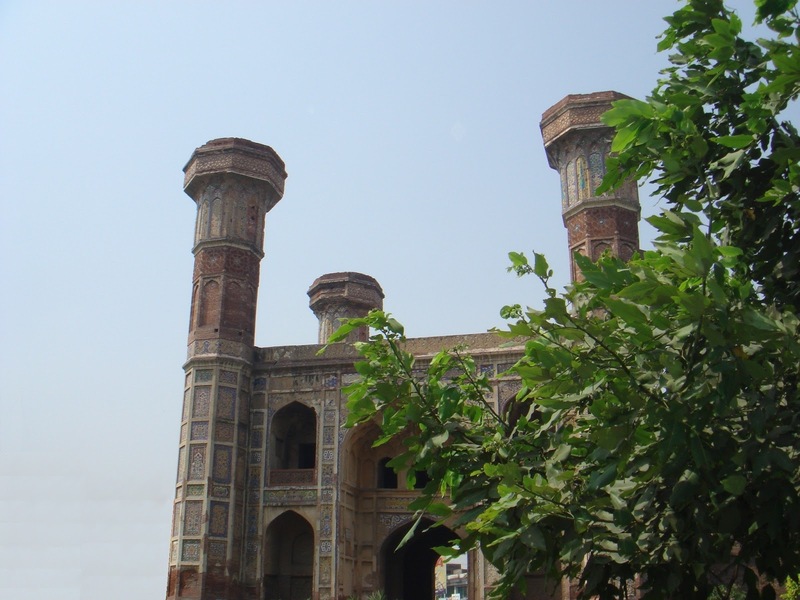 For those intent on exploring the cultural heritage of Lahore, there are the well-known sites like Lahore Fort, Badshahi Mosque, and the Shahdara Tombs, all easily accessible by a vehicle. 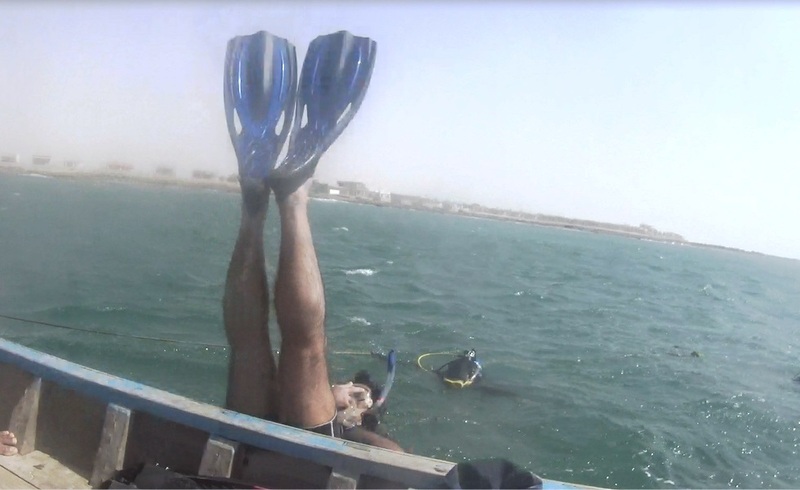 However, I, along with a group of young cyclists, have been pedalling about for the past few months, and have unravelled some curious monuments that are, regrettably, not the usual ‘must see’ items in travel guide books. While their location in narrow alleys and congested bazaars may be a reason for their inaccessibility, their dilapidated state may be a better explanation of why few are interested in sparing time to get there. Sunday being a regular ‘working’ day for our cycling group of young professionals – with this able old hand alongside – we started with Begumpura area. 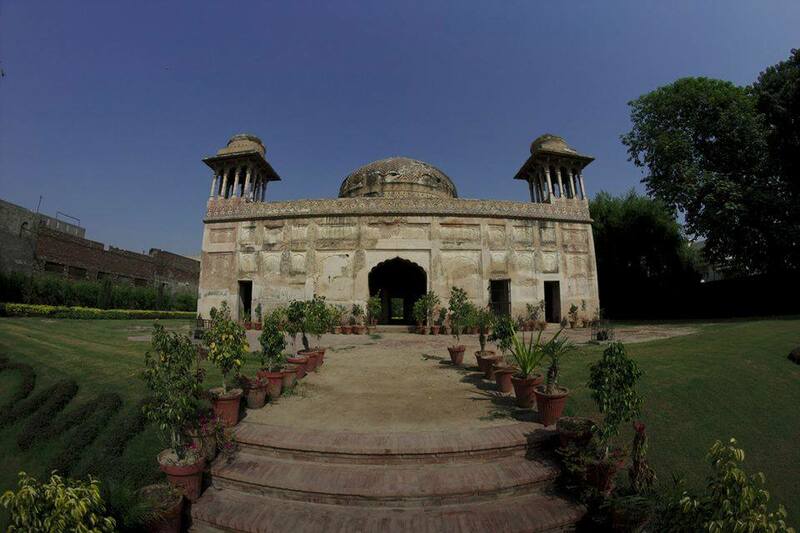 The locale carries its name after Begum Jan, the mother of Nawab Zakariya Khan, a Governor of Punjab during the reign of the lesser Mughal Emperor Muhammad Shah. Heading west on GT Road, I watched the distance on the bike GPS computer roll up to 1.8-km from the preceding Shalimar Link Road intersection. As expected, this is where the striking two-storeyed Gulabi Bagh Gateway, profusely decorated with brilliant, floral-themed Kashi-kari mosaic tiles, came into view on the right side. The gateway appears reasonably well-preserved, compared to many other monuments of that era. The Gulabi Bagh was laid out in 1655 as a pleasure garden by Mirza Sultan Beg, a cousin of Emperor Shah Jahan’s Persian son-in-law, Mirza Ghiyas-ud-din Beg; the latter helped Sultan Beg climb up the nobility ladder, to the rank of Mir-ul-Bahar in the puny Mughal Navy. Fascinatingly, the words ‘Gulabi Bagh’ are said to be a chronogram whose hidden numerical value stands as 1066 (Hijri) – or 1655 AD! Besides the main entrance arch (peshtaaq), the façade has four smaller arches; of the latter, the two on the ground level are simply deep-set alcoves, while those on the upper storey are openings of balconies set with stone-carved jaali guardrails. 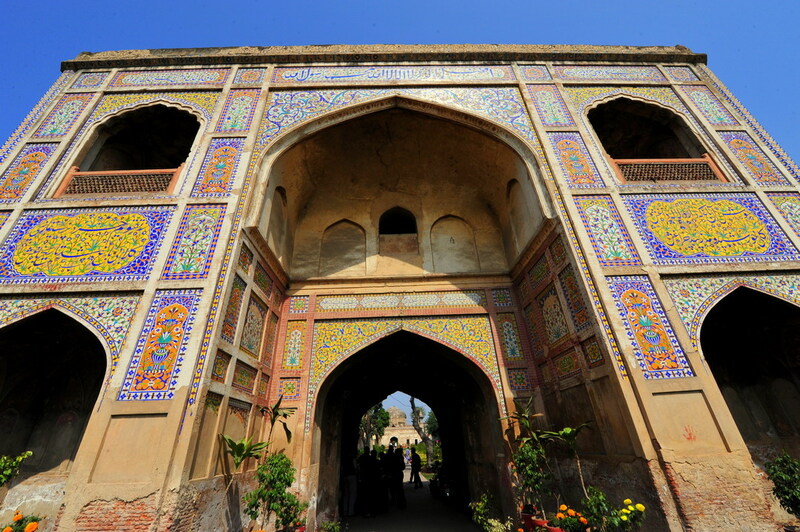 This Timurid ‘aiwan’ design of the gateway is common to many pleasure and funerary gardens of the Mughal era. The roof of the structure is, however, not topped with any minarets, kiosks or turrets, as is the case with most other Mughal garden gateways. Thence appeared the flowers of Sun and Moon as lamps for adornment. The Gulabi Bagh is no more extant in its original size and splendour. The present-day gardeners have, however, made a modest attempt at creating a garden with clipped hedging plants arranged in geometric patterns. With unsightly residential buildings encroaching on three sides, what is left of the garden is actually a narrow stretch leading up to the tomb of Dai Anga, about 100 metres ahead. If the tomb was constructed in the centre of a square garden, as was usual, the area of the original Gulabi Bagh works out to be about ten acres. Walking up to the squat tomb of Dai Anga, we first went around it to check the commotion. To our surprise, children who were playing cricket just behind the tomb scurried away, and some women hastily shuffled indoors, adjusting their dopattas in the presence of strangers who, they thought, were trespassers on their property! 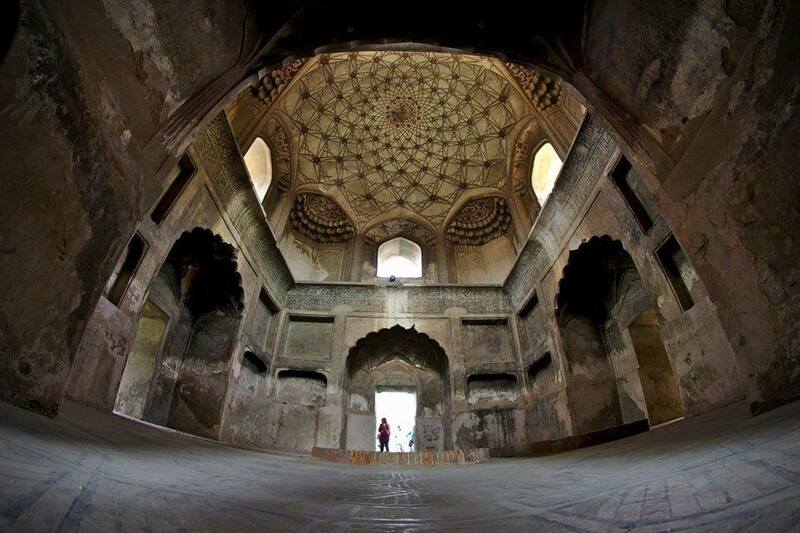 When Emperor Shah Jahan’s wet nurse, Dai Anga, died in 1671, she was entombed in Gulabi Bagh. Mirza Sultan Beg, whose pleasure garden was appropriated for funerary purposes, was most likely her son-in-law, for a second grave of a certain Sultan Begum lies adjacent to Dai Anga’s. This grave is wrongly attributed by some to Shah Jahan’s daughter, for he had none by that name. Mirza Sultan Beg, had not lived long to enjoy his garden, nor was he interred in it, when he died in 1657 in a firearm explosion during a hunting excursion at Hiran Minar, near Sheikhupura. When viewed from afar, something appears odd about the tomb; it does not take long for a keen observer to note that the corner kiosks (chhatris) atop the roof are over-sized. Or perhaps, the Timurid low dome on a high drum, the Rajasthani chhatris, and the Persian cusped arches, are fusion of one style too many for subtlety. The walls of the tomb, now shorn of ‘richly decorated enamelled pottery’ (which the historian S M Latif noted in 1892) give a rather bland appearance. 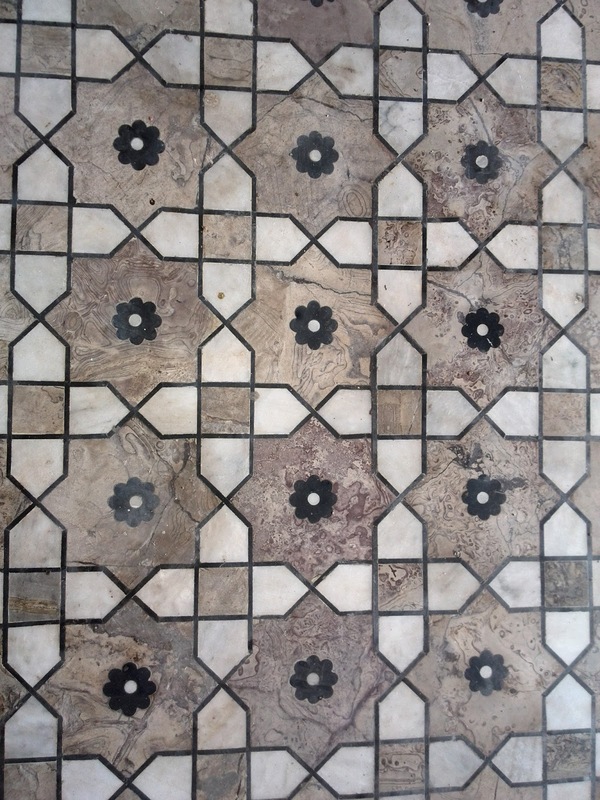 Remnants of a chevron patterned mosaic on the dome are visible; arabesque and floral-themed Kashi-kari mosaic tiles can also be seen to run along the top of the tomb. Entering the main chamber of the tomb, we were careful not to step on the low brick cenotaphs, which had been put up after the original marble ones were removed, purportedly by Sikh vandals. The actual graves are in an underground chamber, now sealed and inaccessible. The upper walls of main chamber are richly embellished with Quranic calligraphy, while the inside of the dome depicts an apt celestial theme. The main chamber is surrounded by eight interconnected smaller ones, based on a floor plan known as Hasht-Bihisht or Eight Paradises. How convenient, I thought, to have such a walk-in convenience for the Hereafter! Suckling the infant Khurram (future Shah Jahan) certainly boosted Dai Anga’s family fortunes, for her husband Murad Khan, a magistrate in Bikaner, became a favoured courtier under Khurram’s father, Emperor Jahangir. 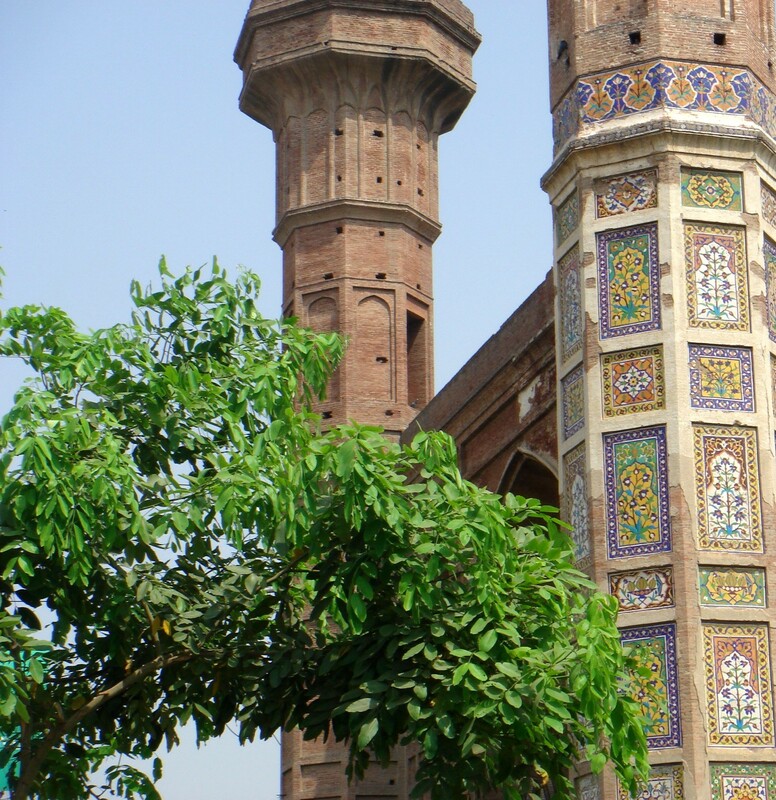 Dai Anga’s name also lives on for her services to the public, as she built a mosque in Lahore’s Naulakha area in 1649, before she proceeded for Haj. It is a pity that someone who bequeathed Lahore with one of its most beautiful mosques, lies in an utterly neglected tomb. Sarv-wala Maqbara, always had an oddity about its name, so after doing the Gulabi Bagh, we pedalled on to find out more. Winding around some narrow streets, we soon got to the tomb, which is actually just 200 metres north on a crow’s flight from Dai Anga’s tomb. Were it not for the decorative tiled panels with the cypress motif, one could mistake the square structure for an overhead water tank. 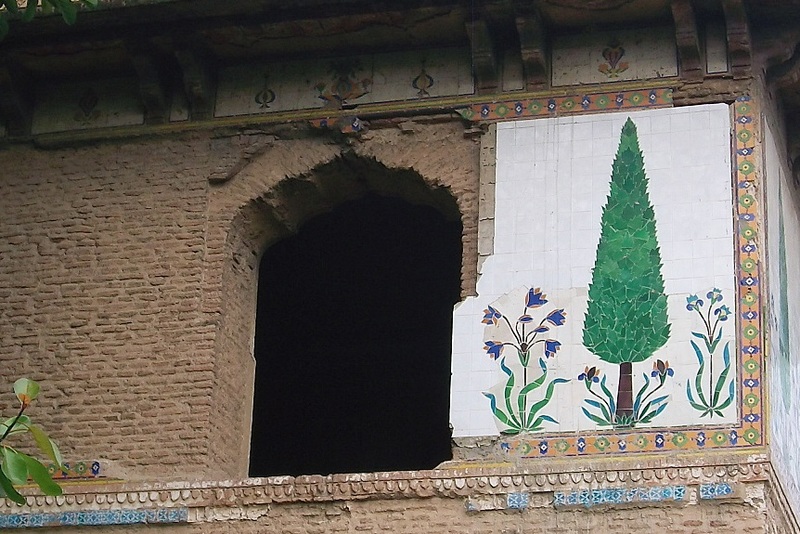 The tall green cypresses, with an undergrowth of brilliant blue irises, make the tomb unique, for the cypress symbolism of eternity and agelessness so common in Persia, has rarely been expressed in the sub-continent’s funerary architecture. Sharf-un-Nisa Begum, the occupant of the tomb, was the unmarried sister of Nawab Zakariya Khan, the Mughal Governor of Punjab. Given to piety and religious ritual, she used to recite the Quran each morning in this tower, climbing and descending by a ladder. On her deathbed, the virtuous lady expressed her desire to be buried inside the tower, up and away from the inquisitive eyes of the passers-by. A Quran and a bejewelled sword are said to have been placed on the sarcophagus at the time of burial. All openings were bricked up and the upper walls covered with cypress-themed ceramic tile panels, four to a side. Though much has been made of Sharf-un-Nisa having designed the tomb herself, it is more likely that it was already an elevated garden lookout of the Nawab family, and was improvised as a tomb on the lady’s desire. The tomb was built in the first half of the eighteenth century, though some sources are more definite about the year being 1745. 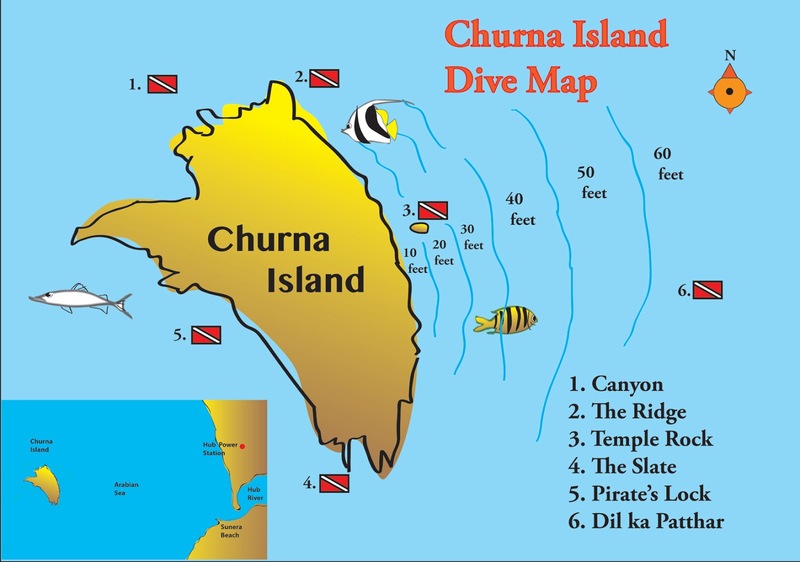 During the Sikh reign in Punjab, the tomb was pried open and ransacked to hunt for supposed hidden treasures. It was also stripped of bronze facing on the lower portion of the walls, leaving them with a battered, forlorn look. Keen to peep inside from the single arch that remains open after the Sikh vandalism, we arranged for a ladder from one of the nearby houses. Since the ladder was not tall enough, and several ‘Spiderman’ attempts had failed, we thought we might have been spared an unwelcome reception by bats and creepy crawlies in a dusty cavern. Hemmed in by houses, criss-crossed by overhead electric wires, and used as a cricket playground in its immediate surroundings, one wonders how long before Sharf-un-Nisa’s tomb cypresses wilt away, bringing her quest for eternity to a poignant end.